This is an authentic antique map of Japan and Korea, showing portions of China, Landt van Eso and Compagnies Land. The map was published by Jan Jansson in his Nieuwen Atlas out of Amsterdam in 1658. 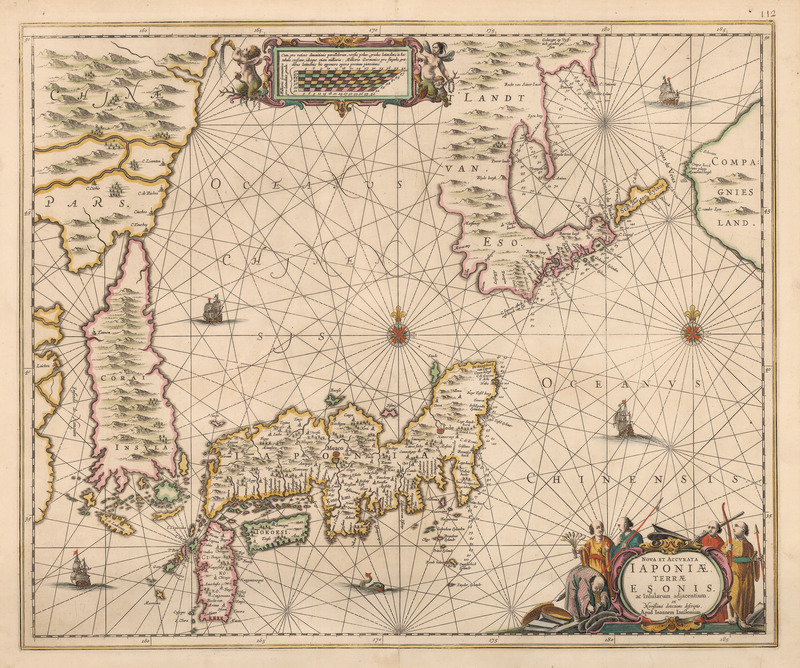 This is a rather important map of Japan and its surrounding islands, particularly with regard to the two large land masses, Compagnies Landand t’Landt van Esso. The original motivation behind the discovery of the lands that influenced this map came for a 16th century Spanish legend. The legend tells of a land to the east of Japan that is so rich with silver and gold, that the homes if the inhabitants were constructed from precious metals. This legend ultimately prompted two voyages funded by the Dutch East India Company. While the first voyage proved to be a complete failure, a second under Maerten de Vries and Cornelius Jansz Coen in 1643 was somewhat of a success with regard to the discovery of new lands. Sadly none of the land discovered resembled rang true to the old Spanish legend. The lands discovered by Vries and Coen were actually the island of Hokkaido, which is mapped as Eso and connected to the Russian island of Sakhalin and the Kruil islands of Kunashir (Staten Eylant) and Iturop (Compagnies Land). The lands and their erroneous delineations discovered by the Dutch explorers ultimately found their way into this map and remained in maps for around 150 years. Another geographical misconception worth noting is the mapping of Korea as an obvious island that is ever so slightly separated from the Asian continent. While the base theory for mapping Korea as an island are unknown, the cartographic origins can be traced to Japoniae Insulae Descriptio, published by Abraham Ortelius in 1595. Ortelius’ map was originally drawn by the Portuguese Jesuite Luis Teixeria. As this map shows, very little was known about Korea. Only one place name is provided (Tauxem), which based on location alone, one can assume is an early mapping of Pyongyang. While the southerm tip shows a relatively accurate archipelago, the only name that appears is L. de Ladrones (Jeju), which translates to “Land of Thieves.” The island likely achieved such a name as the area was known as an epicenter of eastern piracy. Like this map? Check its availability here.